Well, after more emails than I care to think about, and after being tempted to give up on the entire concept, Agile Software Requirements: Lean Requirements Practices for Team, Programs, and the Enterprise is now (again) available in native Kindle format from Amazon. Thanks to Chris Guzikowski, the Addison-Wesley team and Amazon for finally making this happen. Of course, it is also available in Ebook format from InformIT. as well as a discussion of lessons learned in a number of larger scale transformations. Agile Software Requirements is Available in eBook Format. I’m happy to finally announce that Agile Software Requirements: Lean Requirements Practices for Teams, Programs, and the Enterprise, is again available in ebook form from InformIT. With the purchase ($31.99 at this writing) you can download it in PDF and EPUB format. PDF files work just fine on Mac and PC, and the EPUB format is compatible with a number of mobile readers including iBooks on Ipad. This is the version I use as it provides adjustable fonts and decent navigation. The watermarked PDF files are also compatible with the “Latest Generation” Kindle, 2nd Generation Kindle, or Kindle DX. Note on the native Kindle ebook format: unfortunately, we are still working with Amazon to restore the native Kindle version. There were problems with the large graphics in the book which we are still attempting to resolve. In the meantime, however, there is a converter available at http://www.informit.com/store/ebook-formats/kindle.aspx which you can use to convert the EPUB or PDF files to a native Kindle format. (However, I haven’t tried it, as I gave up my Kindle for my Ipad sometime back). I was recently interviewed by Yvette Francine of the on line magazine techtarget.com with respect to some questions regarding Agile Software Requirements. She asked some interesting questions about the book, the method and some opinions on related topics. Part I of the interview can be found here. Background: In this series of posts, I’ve been using medical device development (as Regulated by U.S. FDA via CFR 820.30 and international standard IEC62304) as an exemplar for suggesting ways to develop high quality software in regulated (and other high assurance, high economic cost of failure) environments in an agile manner. This series is sponsored, in part, by Rally Software Development, with special thanks to Craig Langenfeld for his contribution. A note on V&V: As we described in earlier posts, while there is no perfect discriminator between verification and validation activities, in agile verification (…providing objective evidence that the design outputs of a particular phase of the software development life cycle meet all of the specified requirements for that phase) occurs primarily and continuously during the course of each iteration. Validation (… confirmation by examination and provision of objective evidence that software specifications conform to user needs and intended uses, and that the particular requirements implemented through software can be consistently fulfilled) typically occurs primarily in the course of special iterations dedicated to this purpose. Generally, the testing of nonfunctional requirements occurs during these special iterations, and it is therefore probably sensible to think of this testing as a primarily a validation activity. The first 90% of the software takes 90% of the development time. The remaining 10% of the code takes up the other 90% of the time. In the last post, we described testing the features described in the Product Requirements Document as an important verification activity, which is largely independent of the testing we perform for the individual stories. In this post, we’ll describe the other dimension of product requirements the nonfunctional requirements (which are typically also contained in the PRD) that describe the “ilities” of the subject device or system. If we are not careful, these special “quality requirements” will take up the “other 90%” of our total development time. 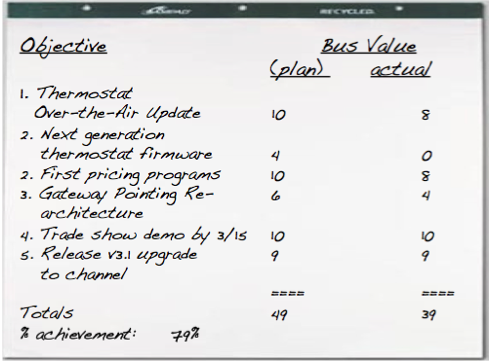 Performance – response time, throughput, capacity, scalability, degradation modes, , resource utilization. Design Constraints can also be particularly relevant in the development of high assurance systems. These can refer to items such as: follow all internal processes per the companies Quality Management System, and use only components which themselves have been validated, adherence to comprehensive safety standards such as IEC 60601-1 (which covers generic safety requirements for medical devices including a list of hazards and their tolerable limit of risk) as well as a potentially long list of other such requirements. No matter their nature or source, these requirements are just as critical as the functional requirements we’ve described in user stories and features, for if a system isn’t reliable (become unavailable on occasion) or marketable (fails to meet some regulatory requirement) or isn’t as accurate as the patient/user requires, then, agile or not, we will fail just as badly as if we forgot some critical functional requirement. 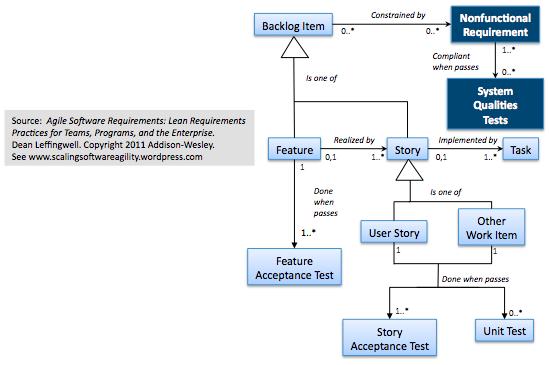 As seen in the requirements metamodel below, we’ve modeled them a little differently than we did features and user stories, which from an agile implementation perspective were all modeled as transient backlog items. This is because the implementation of features and stories tend to somewhat transient in nature, and (subject to automated testing and verification infrastructure), you can discover-them, implement-them, auto-test-them and “almost-forget-them”. Such is rarely the case with NFRS as many of these must be revisited at every increment to make sure the system — with all its new features — still meets this set of imposed quality requirements. some must be tested with special harnessing or equipment, and therefore may not be practical in each iteration. Example: application pressure must be accurate to within +/50 millibars across the entire operating range. some require continuous reasoning and analysis each time the system behavior changes (at each increment). Example: adhere to IEC 60601-1 device safety standard. As we can see, the testing of many NFRs is simply not automatable, and therefore some amount of manual NFR testing is left to the validation sprint. 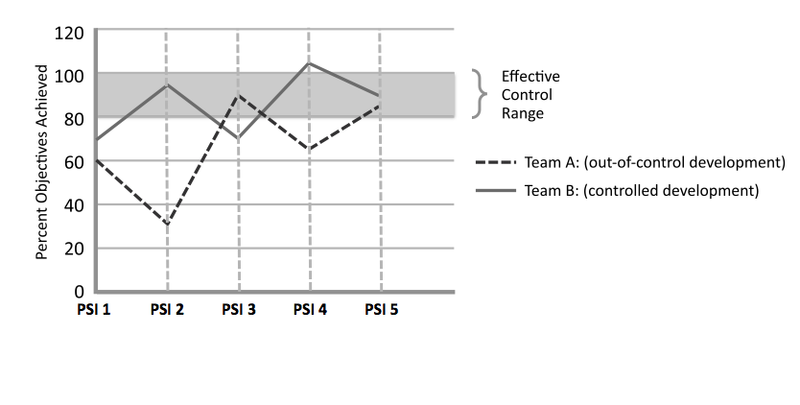 If the items can be automated, the teams should surely do so, but either way, comprehensive regression testing (and documentation of results) of these “system qualities” is an integral part of the validation process. In this post, we’ve described how full regression testing of a systems nonfunctional (quality) requirements is a validation activity typically required at each increment (PSI) boundary, and how some of this effort will likely be manual. To this point, we’ve described most of the testing activities required for building systems of high assurance. In the next post, we’ll take an even broader look at agile testing practices in the context of high assurance development. Agile Software Requirements is Now “Released”! Phew! As with any good agile release, where the availability of incremental and valuable content precedes the big event, the actual release of my new book, Agile Software Requirements: Lean Requirements Practices for Teams, Programs, and the Enterprise, feels a bit anti-climatic. However, after a period of — well basically it felt like forever — the book is now available on technical bookshelves across the country. And as with every good release, one is always reminded to take a pause to celebrate, and especially to thank the contributors. Well, that was the pause. Now, I sure hope some people read it. To (hopefully) initiate a bit of that, and for overview purposes, here is some of the front matter that describes the book. I was walking through some blog posts in the requirements category today looking for a later version of the full “agile requirements metamodel”. 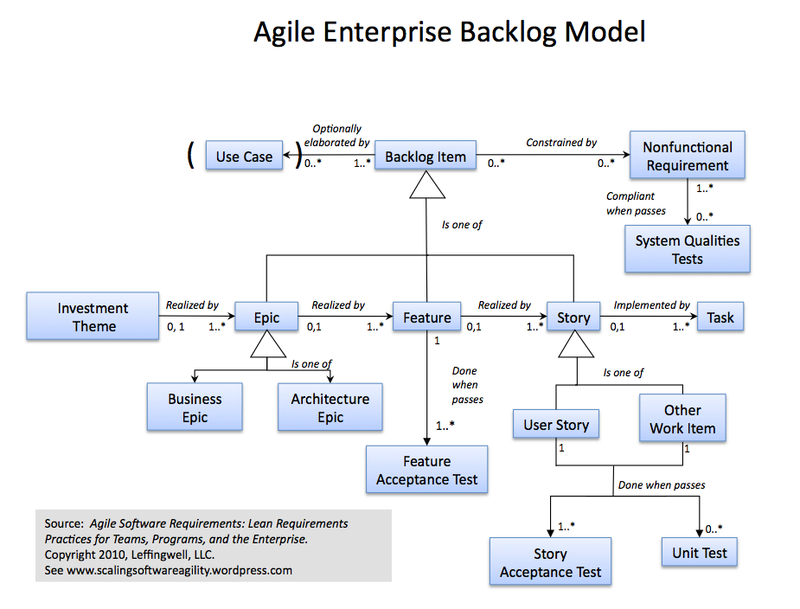 (Some readers commented that “enterprise backlog model” might be a better descriptor, and I tend to agree). The model has evolved and been refined based on peer reviewer feedback (thanks Gabor and others….) of Agile Software Requirements. Evidently I didn’t track that evolution here on the blog, so here is the updated graphic of the final, (at least for this book version) full model as it will appear in the appendix of the book. Note: This metamodel is also integral to the work I’m currently doing with Craig Langenfeld on applying agile development to high assurance systems, so I’m tagging this post to that category as well. While the book Agile Software Requirements: Lean requirements Practices for Teams, Programs and The Enterprise, is still going though final production edits and artwork revisions at Addison-Wesley, it is now available for pre-order on Amazon. It should be available for shipment in the next 60 days. Here’s a few praise quotes from the inside pages. “Dean captures the essence of Agile in entirety, all the way from the discrete user story in the “trenches” to complex software portfolios at the enterprise level. The narrative balances software engineering theory with pragmatic implementation aspects in an easy to understand manner. It is a book that demands to be read in a single sitting.” —Israel Gat. Cutter consortium. “This book presents practical and proven agile approaches for managing software requirements for a team, collaborating teams of teams, and all across the enterprise. However, this is not ‘only’ a great book on agile requirements engineering; rather Leffingwell describes the bigger picture of how the enterprise can achieve the benefits of business agility by implementing lean product development flow. His “Big Picture” of agile requirements is an excellent reference for any organization pursuing an intrinsically lean software development operational mode. Best of all, we’ve applied many of these principles and practices at Nokia, (and even helped create some of them), and therefore we know they work. ” —Juha-Markus Aalto, Agile Change Program Manager, Nokia Corporation.